"This is the third CD Matthew has put out where he has people writing letters to him, and through prayer and writing thoughts down, he has developed this stunning album based off of those letters. "Day 1" is on the radio right now; most of the stories have a song. Also check out his first two story-song CDs, "Into The Light" and "The Story Of Your Life"." For more information on "Live Forever" by Matthew West, visit our website here. This is an educational read. My non-fiction for the year, as I like to call it, although I have been learning to appreciate non-fiction a little more each month so you may hear more from me yet. But as far as Through a Man's Eyes goes, I would almost say it was riveting - as riveting as non-fiction can get. We've all seen or heard of those books that open with a warning. Something along the lines of "Don't read this book, unless...you want to die a dastardly death". "Before we get started we want to ask you to do one thing: make sure you are ready or able to read this book. 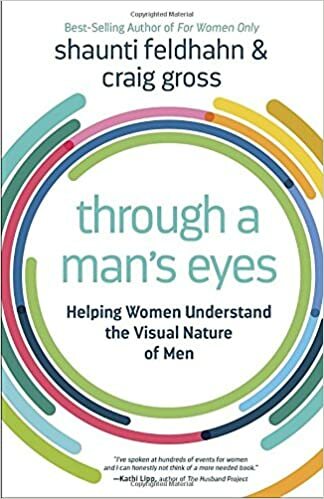 If you are feeling ultra-vulnerable, very scared, or already resentful at the idea of learning what it means that men are visual...please don't read this book right now. Come back to it another time." And they're not being silly or childish. The topic they're approaching is touchy, controversial, and hard to swallow at best, especially with people having their guard up extra high now, or so it seems. I read through it whether I was ready to or not, and I hope I was, because I found it very insightful. Very truthful. And most of all, helpful. I won't review it in as much detail because the title is self-explanatory for the most part, but I will say that the lessons therein built my empathy, my understanding, and my self-respecting ideals. Shaunti and Craig do not try tell you how to live, but they do suggest how you might like to live in light of some key truths. They are not trying to force anything down anyone's throat - hence their timely warning - and they are not placing blame on anyone or anything. Through a Man's Eyes is meant to be insightful, and entirely at the reader's own discretion. How you take it will depend entirely upon how you see it. For more information on Through a Man's Eyes by Shaunti Feldhahn and Craig Gross, visit our website here. "A similar vibe to "Eye On It" and a tip of the hat to his former band dc Talk. “This Is Not a Test” features a song from dc Talk and a number with Toby's Son TruDog. Capital Kings, MR. Talkbox, NF and Hollyn add to this ear-worm. Once it’s in your head, you’re addicted to it. This CD has a Justin Timberlake-Black Eyed Peas-dcTalk flavor. Check out the "Feel It" video online below: http://www.godtube.com/watch/?v=1BJF91NU"
We've been listening to it for a few weeks in the store, and even after having it stuck in my head for days, I still enjoy it quite a lot. Great sound and lyrics, quite catchy - TobyMac hasn't failed me yet! For more information on the CD "This Is Not a Test" by TobyMac, visit our website here; and here for the deluxe edition. The story of Cecily Faire and Nathaniel Stanton is likely the best of Sarah E. Ladd's Whispers on the Moors Series. I enjoyed all three of them to a certain degree, but there was something more to A Lady At Willowgrove Hall. She seemed to pay more attention to the emotions and the characters - Cecily and Nathaniel. That's not to say her characters in her other books suffered any neglect, but Cecily and Nathaniel felt more developed and rounded, and I found it easier to fall into the story with them. Cecily starts off on the wrong foot entirely. Her father disowns her and drops her unceremoniously on the doorstep of a ladies' school in the area, never to see her again, separating her in the meantime from her twin sister, Leah. All as a result of a sixteen-year-old infatuation. And shame plagues her, harshly and desperately, over the dishonour she feels she will be forever responsible for. Now in a fit of circumstance and unforeseen opportunity, Cecily leaves Rosemere, the ladies' school under the guidance of Mrs. Sterling, to become a companion for the infamous Mrs. Trent of Willowgrove Hall. She feels as though she is assuming some kind of facade; living a lie in a constant state of paranoia, fear, and shame. She was not raised to be a lady's companion. Her class status really begs the question of whether she is even eligible for the position. But it is upon Mrs. Sterling's recommendation that she goes, and she refuses to disappoint. Cecily is the most curious mixture of propriety and rebellion, submission and opinion, fearless and fearful. She is so secretive, and yet so intent on being honest. So strong willed, and yet so very fragile. And she hides a tormenting secret. When she meets Nathaniel, he's the image of propriety, dedication, and loyalty. Far too good for her. But to him, she is kind and proper and has every bit of innocence he believes he lacks - far too good for him. He has his own secrets to hide. And if they're both too good for each other, then where does that leave them? 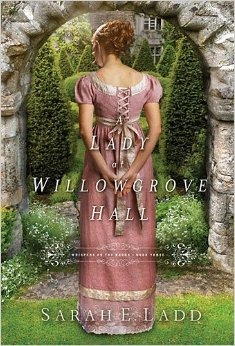 For more information on A Lady at Willowgrove Hall by Sarah E. Ladd, visit our website here.